George Bush Sr, as he was known, passed away at 22:10 local time on Friday (04:10 GMT Saturday), a family spokesperson said. 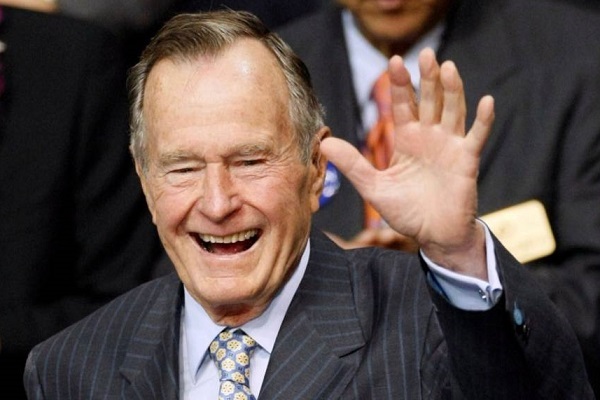 Born into privilege and a tradition of service, Bush was a son of a senator, celebrated World War II combat pilot, student athlete, Texas oilman, Republican congressman, national party chairman, pioneering diplomat and spy chief, reported CNN. After his own 1980 presidential campaign came up short, he served two terms as Ronald Reagan's vice president before reaching the pinnacle of political power by winning the 1988 presidential election, soundly defeating Democrat Michael Dukakis. After losing the White House in 1992, Bush became a widely admired political elder who leapt out of airplanes to mark birthday milestones. Emphasizing the generosity of his soul, he forged a close - and unlikely - friendship with Democrat Bill Clinton, the man who ended his presidency, stated the report. He was president between 1989 and 1993 after serving two terms as vice-president to Ronald Reagan. Bush's death comes after his wife of 73 years, Barbara Bush, passed away on April 17 at age 92. Before her funeral, Bush was pictured in a wheelchair gazing at his wife's flower-covered casket, in a moment that encapsulated their life-long love affair. In April, he was admitted to hospital with a blood infection but had since been discharged, reported BBC. "Jeb, Neil, Marvin, Doro, and I are saddened to announce that after 94 remarkable years, our dear Dad has died," George Bush Jr, who went on to serve as the 43rd US president, said in a statement. "[He] was a man of the highest character and the best dad a son or daughter could ask for." Tributes have started pouring in for the former republican as soon as the news broke. US President Donald Trump praised his "essential authenticity, disarming wit, and unwavering commitment to faith, family and country." During World War Two, he was an aviator before being shot down by the Japanese in September 1944 while on a bombing raid, reported BBC. Following his honourable discharge from the navy in 1945, Bush married then 18-year-old Barbara Pierce. Their marriage would last 73 years and they would have six children together. In addition to the 43rd president, Bush is survived by his son Jeb, the former Florida governor and 2016 presidential candidate; sons Neil and Marvin; daughter Dorothy; and 17 grandchildren. His daughter Robin died of leukemia as a child, a tragedy that still moved Bush deeply late in his life. He will be buried alongside her and the former first lady at his presidential library in College Station, Texas, reported CNN. Funeral arrangements will be announced at a later time, according to the statement released by Bush's spokesman Jim McGrath. Bush, alongside national security adviser Brent Scowcroft and Secretary of State James Baker, engineered a soft landing for the Cold War as the Soviet empire shattered and Germany unified and then prospered -- despite widespread distrust at the time of its history and motives. "This will not stand. This will not stand, this aggression against Kuwait," Bush vowed before getting to work on a successful mission that united US allies in Europe and the Middle East in a lightning war. Later, with Iraqi forces routed, Bush decided not to push on to Baghdad to oust Saddam Hussein. That instinct later came to look prescient, given the blood and resources expended by the US in his son's own war against Iraq. Also on his watch, Washington backed early diplomacy between Israel and the Palestinians, which led to the Oslo accords in the Clinton presidency.